Following on from the hardship of World War II and rationing, the fifties was a time of relative prosperity. Disposable income combined with an increase in mass media encouraged the consumption of fashion. New hair care products, including one-step colours, were designed to allow women to do their own hair easily at home – and women did everything that was possible to change their hair. Here’s our look at popular women’s hairstyles during the 1950s, what influenced style and some common accessories. Mass media was the main influence on fashion. Movies, magazines, advertisements and the new kid on the block – television – all played a part. 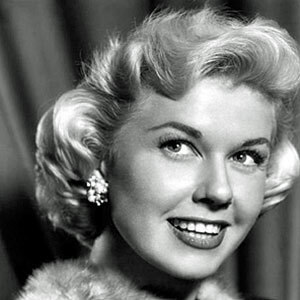 Popular film stars like Audrey Hepburn, Sophia Loren, Grace Kelly, Elizabeth Taylor and Doris Day influenced the latest hairstyles. Others like Marilyn Monroe and Jayne Mansfield had their influential trademark looks. 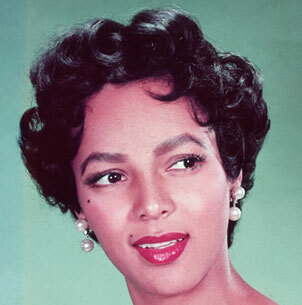 Dorothy Dandridge with the popular Italian cut hairstyle, as seen first on Italian actresses. There was a love for Italian fashions, attitude and lifestyle during the ’50s, particularly in the USA. While movies and the people in them were still very influential on style, television was the ‘next big thing’ and more people were now devoting their free time to staying in and watching the box. This had a huge influence on how people saw themselves and the world around them. Hairdressers were making their mark, creating styles for their clients and helping to popularise fashion styles. The prominent hairdresser for the Hollywood movie industry was Sydney Guilaroff – the first hairdresser to get a screen credit for their work. Since the 1930s, Guilaroff had done the hair on many films. His status was such that iconic 1950s actress Grace Kelly chose him to style her hair for her 1956 wedding to Prince Rainier of Monaco. Popular music influenced teenagers in particular, especially when rock and roll rocketed into the charts in the mid-’50s. Rock and roll was the music upstart of the decade and defines the 1950s teenager. More than just a music style, it influenced attitudes, fashion, hair and lifestyle. It divided the younger and older generations and brought black and white audiences together. Teenagers became a recognised demographic in the 1950s. Having less pressure to grow up as quickly as their parents, they could dedicate more time to leisure and had money to spend – the hair companies noticed, making products geared towards the teen market. 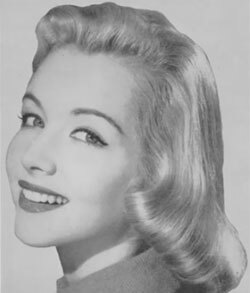 New products and techniques influenced how hair was styled, and the more ‘natural’ look was favoured, even if it was achieved by products and perms. Hair varied in length from short to long, with shorter styles most commonly seen. If someone had a fringe, it was worn quite short, generally no longer than the middle of the forehead. The popular Italian cut hairstyle emerged in the early 1950s, predominantly from the stars of Italian movies. Italian screen sirens Gina Lollobrigida and Sophia Loren had the short and shaggy, yet sculptured hairstyle, featuring all over waves, soft curls and fluffy kiss curls. 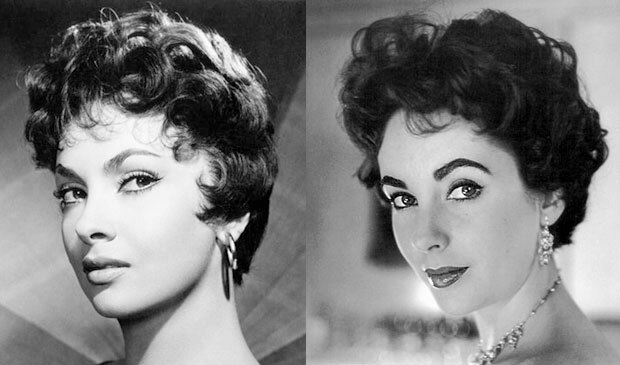 Elizabeth Taylor also adopted the Italian cut at one point. Gina Lollobrigida and Elizabeth Taylor wearing the carefree yet elegant Italian Cut. Shorter hairstyles were popular with the young and old alike and hair could be worn in a variety of ways, but it would always feature soft waves and/or curls. Many shorter styles tended to be quite straight and flat on the crown area, with the curls and waves concentrated around the mid-length to the ends of the hair. Curls would continue all around the hair, including the nape. Other shorter styles include the bubble cut, where the hair was teased into tight curls all over, and the poodle cut. These shorter styles were worn throughout the decade, and the hair was kept ‘close to the head’ and compact in size. However, by the end of the decade, hair was being worn with more lift and volume – hair was getting ready for the birth of the modern bouffant and beehive. 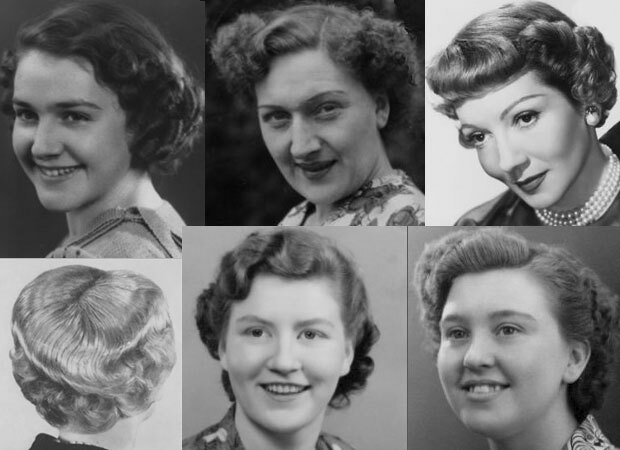 Top L to R: Two women from the early ’50s and a more styled do from a hairdressing magazine. Bottom L to R: Back view showing a pin curled set brushed out; two everyday women. While shorter hair is most commonly seen in the ’50s, some women had long hair, in particular teenagers, students and ‘Beat Girls’ like Bettie Page. Hair could be worn down, or tied back into a ponytail. If someone had a fringe, it would be a short fringe, as was fashionable then. 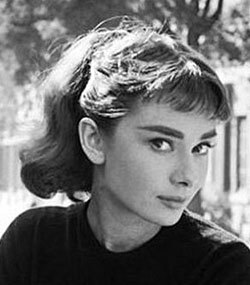 Audrey Hepburn (pictured) wore her long hair in a pony with a short fringe in Funny Face (1957), possibly inspiring the popularity of this look. The high ponytail was a popular look for western teenagers, so much so that this popular hairstyle was seen on the early version of Barbie. The ponytail would often be tied with a scarf. This popular hairstyle could vary in length from quite a short bob to shoulder length. Either way, the hair was worn quite sleek and smooth, possibly with a slight wave at the front, or maybe the sides – that all depended on the wearer’s choice. The ends of the hair were always turned under in a soft roll. Grace Kelly often wore her jaw-length hair in a sleek pageboy. Marilyn Monroe sometimes styled her hair this way too. A really short, elfin hairstyle that emerged in the early 1950s, worn most noticeably by Audrey Hepburn (pictured). 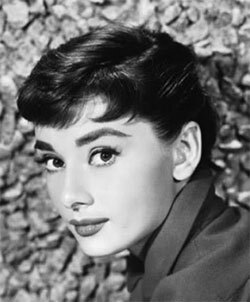 Audrey had her long hair cut during a scene in Roman Holiday (1953), as a mark of her character’s independence. This inspired women to go for a short haircut. Also known as a pixie cut, it is a very short, layered, and almost masculine cut with a high-cut shaggy fringe. There were other short cuts too, like the butch cut. The modern bouffant started in the mid-’50s, getting larger and more popular by the end of the decade before becoming a mane event in the 1960s. 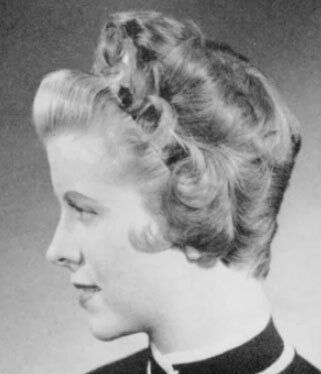 The late ’50s also saw hair piled on top of the head – a forerunner of the beehive. 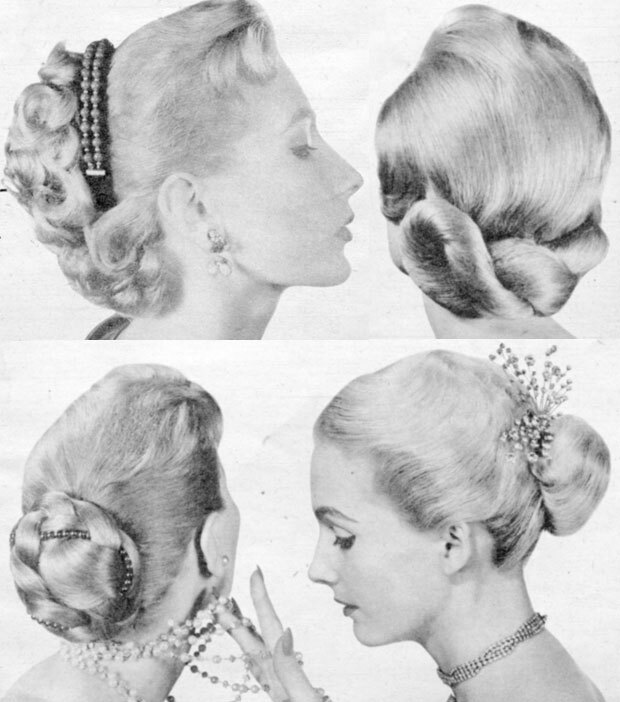 The main element of a bouffant hairstyle was volume and height. Hairspray was needed to keep this look set rock solid – women might not touch their do until it needed washing out completely. Large wire-mesh rollers were now on the market, used to help create the lift needed. Bouffants didn’t go well with hats, but hair could be decorated with jewels, feathers or out-sized bows. 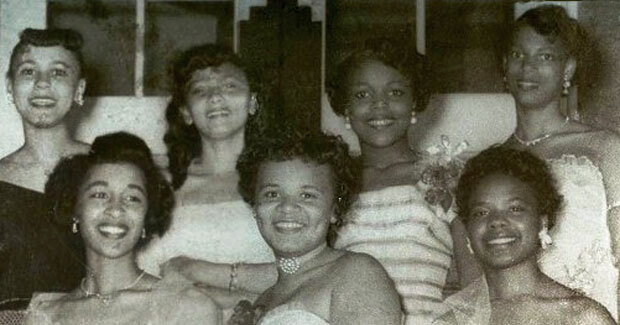 The vast majority of black women in 1950s Britain and America straightened their hair – it was the socially acceptable thing to do. Straightening was done at home or in a black beauty salon. A protective pomade or oil would be put through the hair and a heated metal comb run through it, transforming tight curls into glossy straight hair. It stayed this way until it got wet or was washed. The straightened hair could then be dressed in a 1950s style. The 1950s saw the introduction of chemical hair relaxers. Johnson Products had several lye-based relaxers on the market, including Ultra Sheen relaxers that could be used at home. Once straightened, hair could be cut and styled however the wearer wanted. It was permanent, so stayed straight even after contact with water. Wigs were also popular – a quick and easier way to have the latest fashionable style without having to resort to the time-consuming and potentially painful process of straightening. Towards the end of the ’50s, a tiny minority of women started to leave their hair natural and unstraightened. It would set the ball rolling for the politically-charged Afro revolution of the 1960s. Curls and waves were created mainly by setting wet hair in pin curls. Small rollers and water waving were also used. A setting lotion could be applied and hair dried off under a hooded dryer. This really baked the set into the hair. Pin curls wound in alternating directions (referred to as clockwise and anti-clockwise) creates soft waves, and upright pin curls (or barrel curls) create lift. 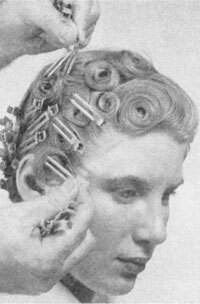 Pin curls were kept in by using hair pins or small metal clips – carefully placed to prevent creasing and a skill in itself! For longer-lasting sets, perming was popular, the curls being created with small perming rods. 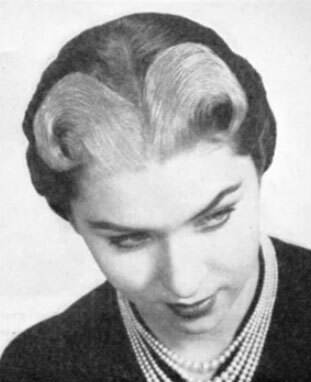 Colouring products and techniques advanced in the 1950s, allowing women to change their hair at a whim at home. Experimentation with colour was seen, and coloured sprays and paint-on colours made it easy to temporarily match one’s hair with the outfit. Even products not meant for hair at all were used! Temporary gold and silver streaks were popular and could be achieved by using tinted metallic powders to sprinkle on the hair, or liquids to paint on. One-step products allowed hair to be bleached, shampooed and dyed easily at home. Small flashes of false coloured hair could be attached to someone’s hair, or glued onto the front hairline with spirit gum. Known as Chameleon Streaks, they came in a multitude of colours. Henna was a popular colourant. Apparently henna was used by Lucille Ball to achieve the auburn-red colour she had. Bleached streaks added a swoosh of blonde to hair, particularly used in the front, and actresses like Marilyn Monroe, Diana Dors and Jayne Mansfield made the ‘blonde bombshell’ look all the rage. Combs and slides were used to control the hair and keep it in place. Hair pieces could be used to embellish shorter hair. Hair pieces were used to add a detail like a chignon or plait. Also used to add length or volume as fashions changed quicker than hair could grow, or to be able to turn short hair into an updo for the evening. Made from real hair, the pieces came in all colours so could be matched to the wearer’s own colour. Some pieces came ready curled and styled – they simply needed pinning onto the head and dressing in with the natural hair. Wigs were reportedly all made by hand from human hair, certainly in the early 1950s. 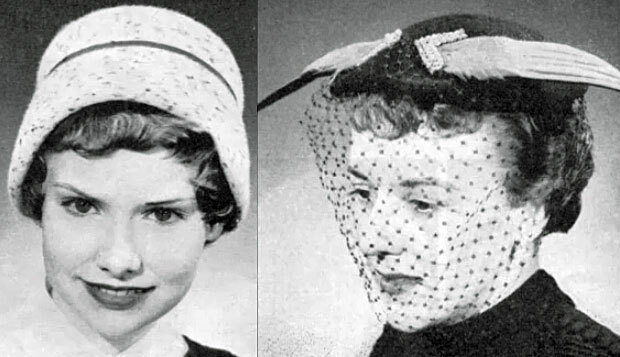 Hats were compact like the flowerpot style (L) and the beret (R) decorated with bird wings and veil (1953). Hats were essential for all but the most casual occasions in the early 1950s. However, by the mid-’50s, hats became worn less often – the formality of having a hat, gloves and bag was tailing off. Plus, hairstyles were starting to get bigger. Hats were small, fairly simply in design and compact. Decorations could be used, like feathers or a veil. Headbands were made of plastic, metal and material. They could be plain or decorated with things like flowers, jewels or fur. Made from material like silk organza, headscarves were loosely draped over the head and tied under the chin. If the material was long enough, they were tied around the neck. By the end of the decade, hair was getting bigger and more bouffant – hair was going one way: up, up, up! The short and tight curled styles were giving way to sleeker, more voluminous styles. 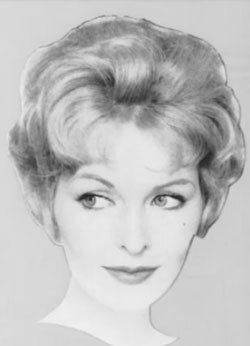 Wigs and hair pieces continued to be worn, becoming an essential hair accessory in the 1960s. And lets not forget that most women back then were certainly real ladies compared to the women of today that Aren’t nothing at all like they were. The green styling gel asked about previously sounds like something I remember as “Dep” styling gel. Hope this helps. I am trying to recall the name of a gel type product that’s was used to “set” hair in the 50s. It was green in a clear bottle about 7 inches tall and was very soupy. I believe it was called Depp. I remember my mother used so much on the sides of my hair after putting in a long tail that nothing moved all day! I think it was called Amami. Friday night is Amami night was always what I heard as a child hair wrapped in rags to make ringlets. Lol those were the days. There was a product called dippity-do that was popular for setting hair. It was Nestle Super Set Wave Lotion it was in a bottle with a soupy green thick liquid that smelled good and was used when putting in pin curls. It was discontinued unfortunately. I would love to find a bottle just for the smell that would take me back to my childhood. My mom used it on us when she put rags in our hair to curl it at night. experience; Drama Feature, TV,Film, Specialist Factual Drama,Opera,Theatre, ‘live’ broadacast. Thanks for info it was very help. My daughter is a model. So this help out a lot. Hi, thank you for the information you gave, but I’m actually looking to try a 50’s style so what information you did have was not exactly what I was looking for. But maybe you can still help me? Hi Seneca – thanks for your comment; what information are you looking for and we’ll see if we can help! Great post. I used this post to look up for information when I covered this topic on my own blog. So thank you.